This is Misha. She thinks winter is already here. Well, it may be in other parts of the country where temperatures have dipped to zero. But here on the west coast, it’s 60F. 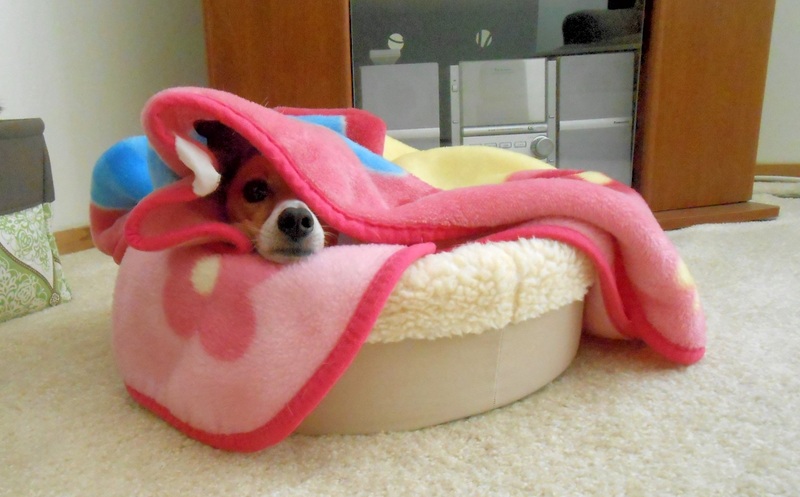 Are all Jack Russell Terriers sensitive to cooler temps? Misha certainly can’t handle anything less than 65F. I’ve seen her burrow when it’s in the 80s. Even our dogs are weather wimps. Misha is already in burrow mode. She thinks 60 degrees is cold. I think it has to do with the small size. Little dogs just have no ability to retain body heat, kind of like small children. My mom’s chihuahua, Dobby, is the same way, although he’s currently also refusing to wear his housecoat (possibly because the other dogs laugh their doggy laughs that he wears a coat that was hand-made for a small cat). Evan, you may be right. At 8 lbs, I don’t think Misha generates much body heat. That’s funny what you say about the jacket. I had my sister’s dog here a couple weeks ago and Misha had to wear her jacket for her walk one day. The big dog was really intrigued by it–to the point of following Misha incessantly. It was kind of funny.